This recipe for Lemongrass Beef over Rice Noodles (Bun Bo Xao) is a classic Vietnamese dish. It’s wonderfully flavorful, fragrant, and best of all, super easy to make. The lemongrass adds amazing aroma to the stir-fried beef. The generous use of fresh herbs and vegetables makes this dish so light and refreshing it’s often called a ” noodle salad”. If you’re short on time, buy frozen minced lemongrass at your local Asian grocery store. I also found minced lemongrass in a squeezable tube (like toothpaste) in the produce section of my grocery store. If you’re watching your carbs, omit the noodles and double up on the veggies. Yum! Making dinner just for two? This recipe is portioned for 2 servings or for one really hungry person. Enjoy! Slice the beef into thin strips about 3 inches long by 1/4 inch thick. Combine the beef with the fish sauce, oyster sauce, ground black pepper, 1/3 Tbsp olive oil and marinate for at least 15 minutes. Mince the lemongrass by hand or using a food processor. Heat a wok over High heat and add the remaining 1 Tbsp olive oil. Add the minced garlic and sliced shallots and stir fry for 10-15 seconds. Add the minced lemongrass and stir fry for another 10-15 seconds. Add the marinated beef and stir fry until the meat is the desired doneness. Add 1/2 cup bean sprouts and stir fry for another minute. To serve, spoon the stir fried beef over the rice vermicelli. Sprinkle the crushed roasted peanuts on top and garnish with the pickled carrots. 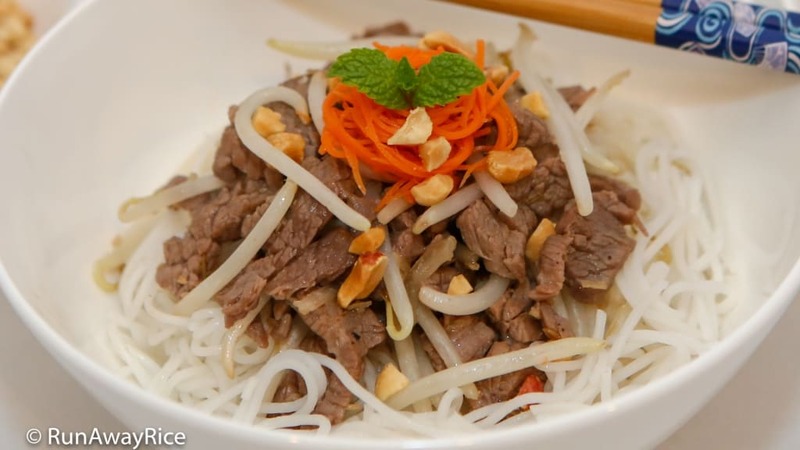 Enjoy the Lemongrass Beef over Rice Noodles with the fresh herbs, lettuce, cucumber and remaining bean sprouts along with a side of fish sauce dipping sauce. We made this last night – absolutely fabulous! Thank you so much for this easy and tasty recipe! It’s definitely on the “let’s make this again” list!!! I am happy to hear you enjoyed the recipe. I love this dish too–it’s light and refreshing but full of bold flavors. Thanks for sharing your results!